Since the beginning of 2005, the main focus was not on the conventional advertising media – TV, radio, print, outdoor advertising, although they are not forgotten, and in the stores. – The strategy was based on the idea to get an enormous advertising effect with the maximum coverage of the stores, where brand to stand out and was presented to the most dignified manner, – the head of special projects TIMEX Igor Baibekov. – We tried to saturate the market for hours, as we know, this is the best advertising products. It was only after this task in the next year move to large-scale, nationwide advertising campaign. In our opinion, it is senseless to invest huge amounts of money into advertising and promoting goods when the market is not saturated with them and the buyer never able to find this product. And such examples we often. Thanks to their own lineup TIMEX necessarily close watch on traditional stores. Brand can be adequately represented in other points of sale. However the focus company “Taymekspansiya” made on the formation of its own network of shops – shops opening monobrendovyh TIMEX. In Moscow alone for four – in the shopping center “MEGA” Khimki, in the shopping center “Real” in the SEC and Brateevo “Europark”. And the end of the year to open two more – in Balashikha and in the shopping center “Real” on signal passage. In addition, two boutiques are already working in the regions – in Kazan and Novosibirsk. And TIMEX not drive yourself into the rigid framework, the design of the Company’s stores “Taymekspansiya” comes from considerations of practicality and convenience to the customer. For example, in MEGA (the store is the first in the world by number of visitors!) It was preferable to open a small shop, which stands on the go with the flow of customers. 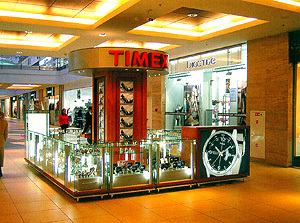 And in a posh mall Kazan “South”, which brings together leading global brands, shop TIMEX corresponds eminent neighbors in its scope and grandeur design. But regardless of whether the watch TIMEX exhibited in a small kiosk or in the spacious monobrendovom store, customers can view the assortment of the brand – from child models to sophisticated collection Youth sports referral systems Advanced. 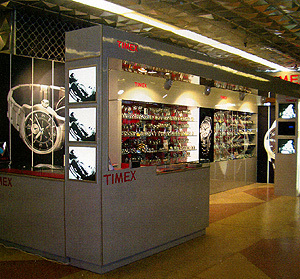 In addition to the main task – to sell watches, each of the salons TIMEX serves another – serves as an advertising showcase of the brand. 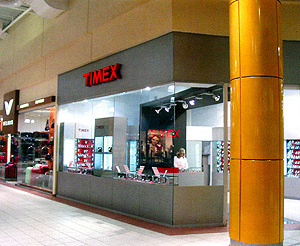 In addition, TIMEX widely and accurately represented in more than a hundred hours of shops throughout Russia. To the peak seasonal sales company TIMEX released a series of new products that are sure to be interested in the domestic buyer. First of all, changes were classic collection – updated its most popular models. There Perpetual Calendar (perpetual calendar) and Easy Set Alarm (Clock with quick setting alarm) with a new version of the design, there was a new series of chronographs, significantly increased the popular line of women’s and men’s watches with color highlights (Colour Indiglo). Touched updates and purely female series, in particular models of East West, which can now boast a wide variety of bracelets, and in which there were new items, full of the yellow metal. Refreshed and women’s series, decorated with crystals Swarovski. The collection E-Tide & Temp added to the usual digital analog clock, equipped with a temperature sensor. And in the very popular line of chronographs Expedition model appeared with a new design and additional features – instant alarm and night illumination Indiglo. Finally, the Russian market will be well-established in the world of sport stopwatches TIMEX. Apart from all the basic functions, they will be equipped with a calculator speed and, of course, branded lighting Indiglo. Following the latest fashion trends, expanded color versions of many sporting models TIMEX. In particular, it will sport a new design very popular in Russia chronographs Ironman. Has changed in appearance and very high demand due to its low price range 1440. According to the management of the company “Taymekspansiya”, 2005-was “the year of the buildup” for TIMEX, which has so far only goes to the Russian market. But we can already draw some conclusions. The greatest demand among buyers enjoy models from collections of Classic and Fashion, showing consistently high sales clock series Sport and Outdoor and virtually no competition in this segment of the market were kids watches Youth. At “Taymekspansiya” confident that in 2006 with the opening of monomagazinov in large cities such as St. Petersburg, Krasnoyarsk, Murmansk and Rostov-on-Don, and in addition, to begin a nationwide campaign to increase sales of the brand significantly. And it will be possible to talk seriously about the expansion TIMEX in Russia.